Representative Judy Chu, the first Chinese American woman elected to the US Congress and the current chairperson of the Congressional Asian Pacific American Caucus (CAPAC), was arrested earlier today on the steps of the Capitol Building. Chu was attending a demonstration demanding the passage of a clean DREAM Act to protect thousands of DACA recipients facing uncertainty and possible deportation after President Trump announced he was ending the program instituted by the Obama administration. 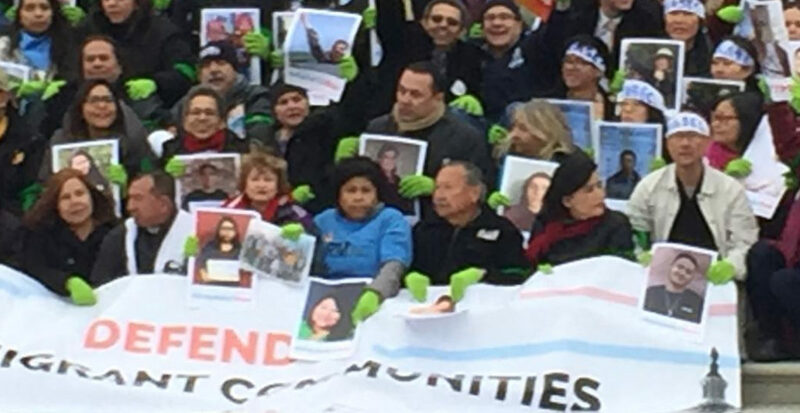 According to a photo and article posted by Los Angeles Times‘ Congressional reporter Sarah D. Wire, Chu was seated in the front row of the demonstration holding a banner that read “Defend Our Immigrant Communities” when she was arrested. She was arrested by Capitol Police after the protesters were repeatedly ordered to disperse. Hours earlier, Chu had posted a photo to Twitter showing her civil disobedience starter kit and declaring that she expected she would get arrested at today’s event. The Trump Administration’s decision to rescind DACA is a cruel and devastating blow to the nearly 800,000 young Americans currently enrolled in the program. This indefensible action is an open attack on America’s immigrant communities and undermines our core values as a nation. That month, Representative Chu also joined several Asian American activists and other members of CAPAC in holding a press conference to call out the Trump administration’s capricious an heartless mistreatment of DACA recipients and other immigrants. This press conference came alongside a 22-day round-the-clock vigil organized outside the White House by NAKASEC and other Asian American activist groups to raise awareness about immigrant rights. Of the over 800,000 DACA recipients in America, roughly 18,000 are Asian; many are Korean. In addition, two-thirds of the Asian American community is comprised of foreign-born immigrants, and according to AAPIData, 1 out of 7 of those immigrants are undocumented and most live in California. Indeed, Asians are now the fastest-growing population of undocumented immigrants in America. Nearly 20% of Asian American voters cite comprehensive immigration reform as an “extremely important” election issue to them, and more than 90% Asian American voters do not believe the Republican party is doing a good job of reducing hostility towards immigrants. Currently, activists around the country are staging coordinated protests and sit-ins demanding passage of a clean DREAM Act in Congress before DACA expires early next year, and Representative Chu — today’s top candidate for all-round badass Asian American woman — is one of several Democratic and Republican lawmakers who are working tirelessly to pressure the GOP-led Congress to act to help Dreamers before it’s too late. Previous Previous post: Yes, All Women. Asian-American Women, Too.